Still gazing happily at my copy of What Every Woman should know, and now it’s joined by another mainly picture book, Women who Write by Stefan Bollmann. This book features pictures of women through the centuries who write, or wrote. There are some fascinating pictures here, arranged by themes as well as broadly chronologically. Sadly there is no list of the authors featured, and I must confess to not recognising some non British authors, which is a reflection of my reading inhibitions rather than their obscurity.These (often) photographs are accompanied by a page of information about the writer, which extends beyond a list of best known works (strangely absent)to a discussion of the themes. 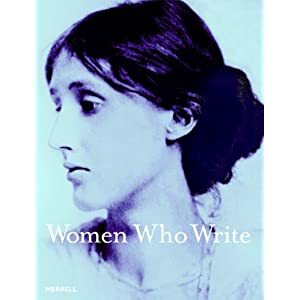 A good starting point for exploring female writers; it is a useful book for me who only briefly touched on feminist theory in my literature MA. The other book today is one I recently finished, having enjoyed it overall. 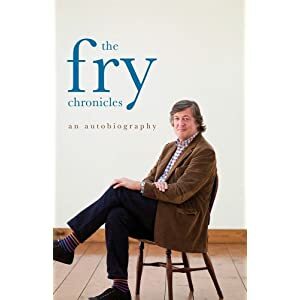 The Fry Chronicles by Stephen Fry is the latest volume of autobiography by this clever, funny and bewildering man. I have enjoyed many of his tv programmes, especially Jeeves and Wooster partly owing to my Wodehouse obsession. I was put off some of his other books by the language, but my copy of his book on poetry has disappeared in this house somewhere…another Fry fan. in their triumphant third year Revue, I was a nervous first year law student…Unsurprisingly I cannot claim acquaintance, but did see the Revue both in Cambridge and Edinburgh. Apparently it was on the tv as well, but in those days we didn’t see a television set for months on end, so I cannot comment. But it was very, very funny. This book is not so funny, but it does record that I wasn’t the only Undergraduate who wondered how I had got there. Fry enjoys life, in the small things as well as the large financial comfort he has achieved, and which he seems grateful and amazed by.He is also painfully aware of so much of his self destructive behaviour, and the uncertainty it produces. Yes he name drops (his account of Douglas Adams being most enjoyable) but in a natural way as he has actually worked with these people. There are many interesting anecdotes, including the development of Blackadder and other tv programmes. This is an interesting book, obviously really written by Fry, of a life which has been generally fortunate. But it is also honest, thoughtful and very interesting for all those who hit their twenties in the last decades of the century, and have the faintest link with this extraordinary group of actors.